Kontent Review 2019: Is Kontent a Good Hosting? Based in Germany, KONTENT is a domain registrar and trusted web hosting service provider that offers affordable green hosting and a number of extras, all backed by great customer service. The company powers over 400,000 domains. KONTENT is a German hosting service and domain registrar that was founded in 2000. It offers low-cost green hosting solutions, professional emails, and SSL to thousands of clients in Europe. Since it was founded, it has hosted over 400,000 domains and websites on its servers. 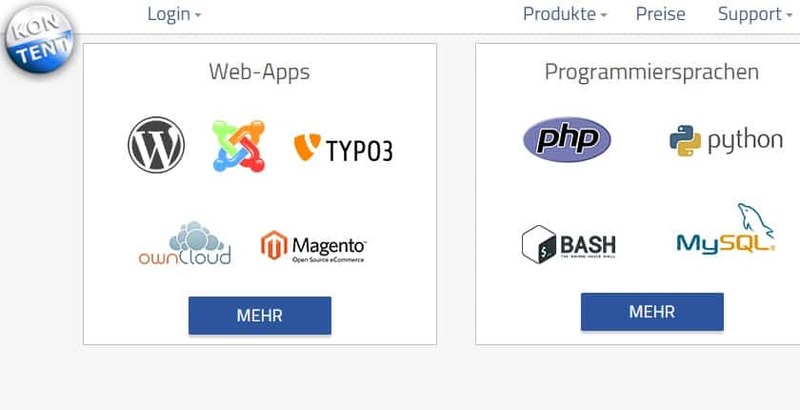 The company’s website is in German. KONTENT gives its customers full access to tools and resources that they’re comfortable with. For instance, starters and amateurs have access to the one-click app installer with over 30 apps including WordPress, Joomla, and others. Web developers also get access to various scripting languages and tools that they can use to build custom websites from the ground up. Once you create your CMS or custom PHP/MySQL website, it’s possible to secure it using the Free Let’s Encrypt SSL or any external SSL certificates. There is a simple guide to help you with SSL installation. In addition, you also have the option to password protect your website directories and deploy anti-spam on your emails. KONTENT creates daily automatic backups of your website files and databases and stores them for a period of seven days, though it advises customers to also back up their data by downloading and saving files to their local PCs via FTP. All of the latest backups can be restored with a few clicks. I know some of you are conscious about the environment. KONTENT uses 100% clean and renewable energy in its datacenter center and offices. Free from nuclear energy and CO2 emissions, this hosting company makes a direct contribution to the green movement. Overall, the website is clean and easy to navigate. I didn’t have any problems checking out its products or comparing pricing. My only wish is for the webmasters to enable Google translate if they can’t do a full translation of the site to English or any of the major European languages. KONTENT has a transparent pricing policy. The amount you see when you place an order is what you’ll pay during check out. I also like the fact that it doesn’t charge customers setup or cancellation fees. Additionally, anyone who signs up for two years or more, is eligible for discounts. From where I sit, I can tell you that the hosting packages are fairly priced and reflect well on their features. Several payment channels are supported including PayPal, direct debit, and all major credit cards (VISA, MasterCard, JCB), and the packages have a monthly billing cycle. 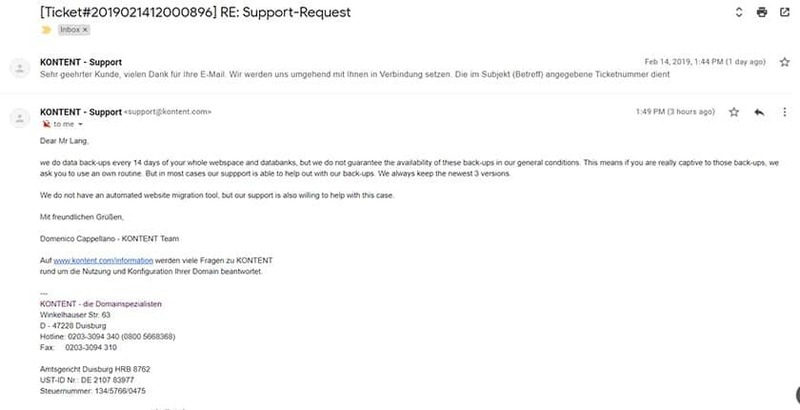 Based on the response I got via email, the customer support team is comprised of Germans with a working knowledge of English. They’re available via a toll-free telephone line from 6:00 a.m. – 9:00 p.m., email, and live chat. Reading the company’s testimonials, it appears most customers seem happy with the kind of support they receive. I also found a number of useful video tutorials that could help with simple things like domain registration, email creation, and website transfers. With secure and robust servers, KONTENT is a web hosting company that offers low-cost and green hosting solutions, in addition to a number of extras such as SSL, DNS, and emails. Wondering how Kontent stacks up against other Web Hosting companies? Enter any other Web Hosting company and we will give you a side-by-side comparison.